I searched the Internet for an article that really described how to pick fabrics for decorating - curtains and drapes, pillows, slipcovers, tables, and more. I won't discuss upholstery here. Toile. One thing I noticed is that toile (pictured here) popped up frequently in my searches. This tells me that it truly is regaining popularity as I mentioned in an earlier post. This fabric is light, classic, elegant and can be used in nearly any application - including wallpaper designs. Use it to evoke an old-world or French feel. Toile works great with a repetition of the same pattern. Chintz. Soft, flowery, romantic. Bedrooms love chintz, but it's equally at home in the living room. This fabric is easy to work with as it's light-weight and made from cotton. Mix and match patterns with similar and complementary colors and create a lovely English Country feel. Sheers. Sheers can be used as an underlayer for drapes or can stand alone in panels or swags. Because of the delicate nature and transparency of sheers, it's pretty much limited to window treatments. You can also get sheers in a wide array of colors - not just white. Use it when you want a light, airy room or minimal sun filtering. Sheers are commonly made from synthetic fibers now. Silk. As a lightweight fabric, you can use it in the same manner as sheers. Just realize it's more delicate than sheers, will water stain, and easily tear. But it's luxurious, lustrous, and gorgeous. In heavier weights or raw silk, you can make rich panels, wall coverings, pillows, more. Raw silk will have more texture. Silk is expensive, but it's unique and truly screams luxury. Brocade and Damasks. While frequently made from silk, these fabrics are typically heavier and have patterns. From windows to furniture, these materials have a home. And they are as appropriate in the dining room as the family room and even more masculine areas of a home, like an office or study. 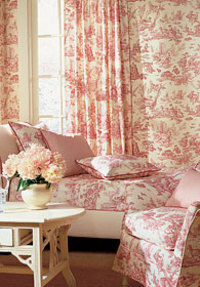 With these fabrics, you should offer complementary accents in other fabrics and patterns so as to note overwhelm a room. Guidelines like these above are helpful, but the key is to find fabric that you love, that radiates your personal style, and gives you inspiration to decorate any room in your home.